"Press Release: Bringing Internet of Things to Internet World 2013"
You might think that “things” have always been connected to the internet. Computers, mobile phones, even printers have been connected for years. A lot of the current talk and investment in Internet of Things is large sensor networks and taking information from our environment. What we at DoES Liverpool like to think of when we talk about the Internet of Things is a whole lot more personal and unexpected. How about a bubble machine that blows bubbles when people mention you or your business on Twitter? Or perhaps a clock or dial that instead of showing time or statistics shows where someone is? These are just two of the ideas that members of the DoES Liverpool community will be bringing to Internet World this month. But first, what is DoES Liverpool? We are many things. We are an online community of creative and often tech savvy people, of tech startups and “makers”. 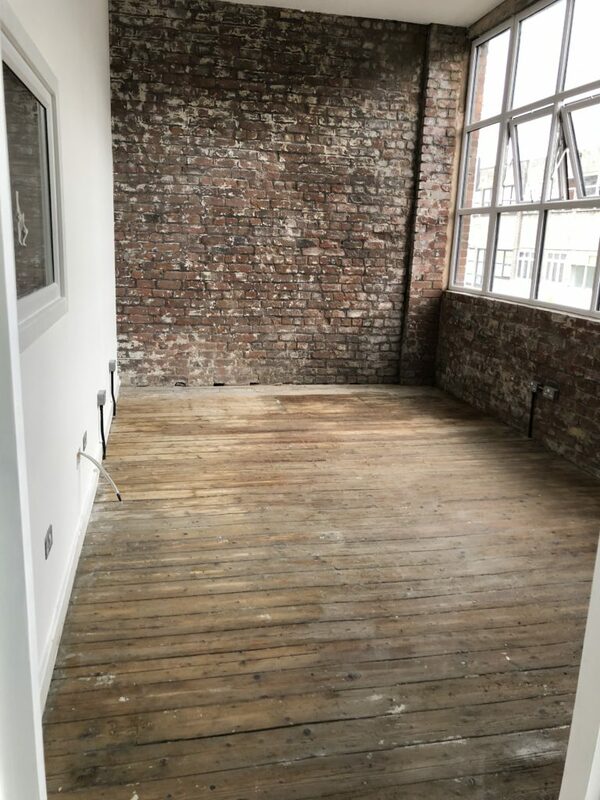 DoES Liverpool is also a physical space. 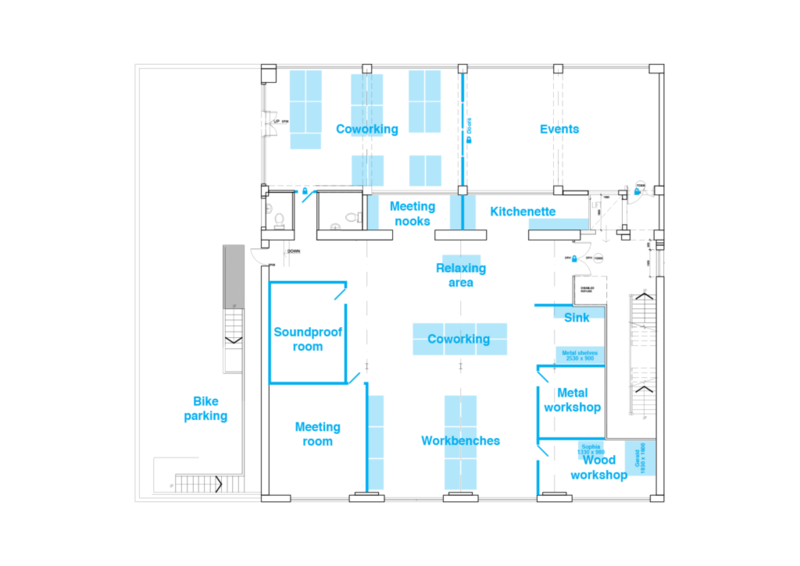 It provides a co-working office space for members of the community to hot desk from or to take a permanent desk. There’s also a shared workshop with lots of equipment available for use; traditional tools such as soldering irons and band-saws to the more modern digital fabrication equipment like the laser cutter and 3D printers. We also hold regular events on many topics from specific programming languages like Python and Clojure through to more business focussed events like Lean Liverpool and Saturday Startup Club. We have a great community coming up with some wonderful ideas, and we’re looking forward to showing some of these to you at Internet World 2013. With another DoES Liverpool co-founder, Hakim Cassimally, Adrian has spent the last year writing the definitive IoT book – Designing for the Internet of Things. Both Adrian and Hakim will be available to discuss their book and IoT in general, and of course you can pre-order the book on Amazon! Inspired by the clock owned by the Weasley family in the Harry Potter books, the WhereDial provides a delightful way to make a personal connection with a family member or friend. The WhereDial is made from laser cut plywood or colourful plastic and features a list of location categories around the dial. Through the cloud based location aggregator – MapMe.At – the WhereDial can retrieve a person’s location from FourSquare, Google Latitude and a variety of other services. It then rotates the dial to show where the person is. It’s a great device for people who are less comfortable using mobile phones and computers but is also a really handy glanceable object that fits nicely on the desk of a technophile too. The WhereDial was designed and is built in Liverpool by John McKerrell, also a co-founder of DoES Liverpool. Perhaps saving the best for last, the final headline item that we’ll be bringing to Internet World 2013 is the Good Night Lamp. Darling of CES and Gadget Show Live, these lamps have a superstar team behind them. They are the brainchild of Alexandra Deshamps-Sonsino, previously a co-founder of smart product design studio Tinker London and the organiser of the monthly Internet of Things meetups in London. She launched the Good Night Lamp as a startup a year ago by committing to taking a booth at CES; 10 months of development later and with a live Kickstarter campaign garnering much publicity she took CES by storm. Her team includes our own Adrian McEwen as CTO; John Nussey as Head of Products and interior designer & architect Konstantinos Chalaris as Lead Designer. We really hope you will enjoy our exhibition and go away inspired, potentially with some ideas for an IoT product of your own! DoES Liverpool is all about inspiring people to start interesting businesses and while our focus is in Liverpool, we know that IoT is going to take off around the world! 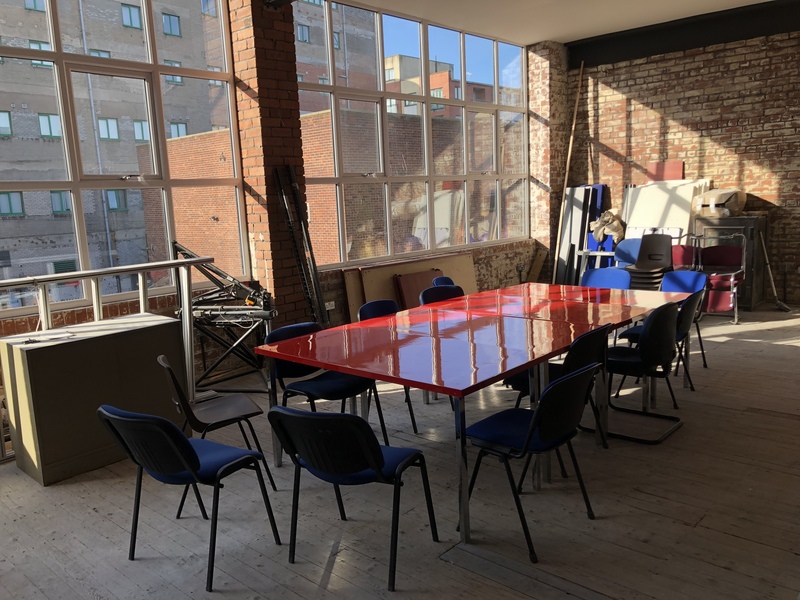 "Press Release: Community Co-Working Space, DoES Liverpool, Opens New Dedicated Workshop Area"
DoES Liverpool, community workshop and co-working space in central Liverpool, has celebrated its first year of operation by expanding its space and creating a dedicated workshop area. With a 61% increase in floor space DoES has been able to create five specialised areas meaning that users can get the best out of each part of the space and avoid causing disruption for other visitors. 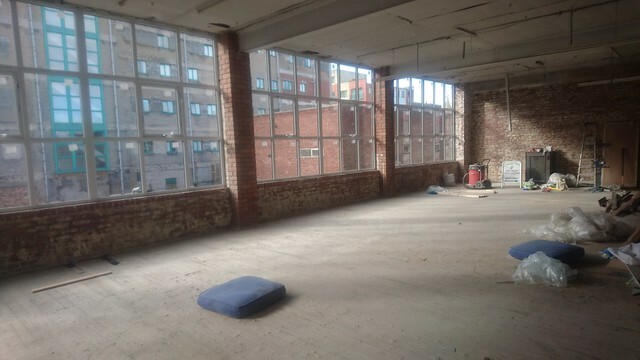 DoES Liverpool is giving the public a great opportunity to visit and try out the space during the Grand Opening on Maker Day 11th August 2012. The workshop now boasts some more traditional woodworking equipment such as a band saw and bench grinder to complement the existing digital fabrication facilities of the MakerBot CupCake 3D printer and LS3040 laser cutter and engraver. Stations for soldering or just general making are available for use during the regular Maker Night and Maker Day events or throughout the week by signing up for a workshop membership or paying for a single day’s use. Storage is included in workshop membership and available for purchase by other visitors. As ever, the first day’s use of the equipment and space is free if you bring along cake to share! 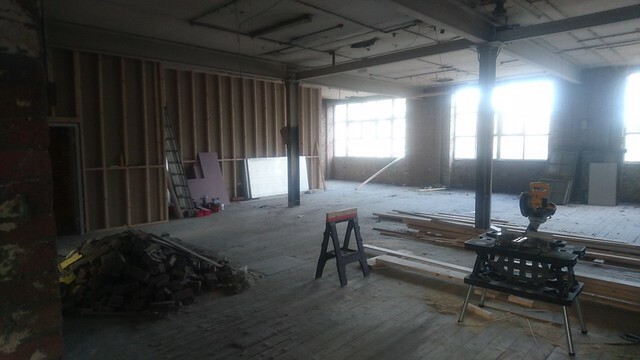 Removing the workshop equipment and much of the storage space from the main room also freed up more space for co-working. A cool new hot-desk hub has been created using an original Gostins dining table, and an existing pod of desks available for permanent members has been expanded. The meeting room now doubles as a comfortable break-out area with a large screen display available for viewing presentations and videos. I’ve rented serviced offices from corporate landlords in the past and DoES has always offered a friendlier atmosphere in comparison. The recent improvements in layout and planned new facilities should make the office space an even better working environment going forward and I’m sure I’ll be using it more often. I enjoy working out of the DoES Liverpool office one day a week. I get a desk, electricity, wireless network, hot drinks, friendly intelligent conversation and networking all for £8 per day. DoesLiverpool also run lots of clubs and user groups – there is plenty going on. It is very creative. This week they opened up a new work shop next to the office area. 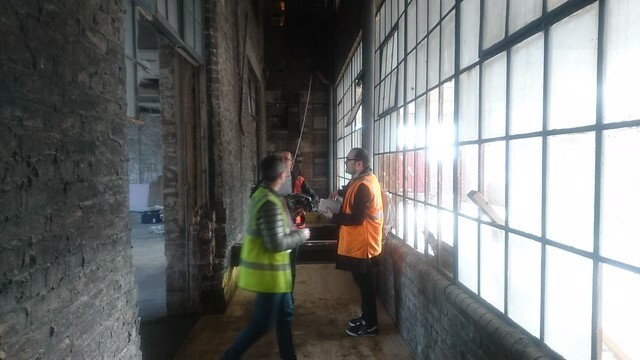 It is light and spacious and now if someone is using the laser cutter or 3D printer I can chat to them but I do not have to hear the machinery. I can also use the laser cutter to make some Xmas presents while I am there. The meeting room allows me to organise meetings here rather than at my home. Further changes are planned including a newly fitted kitchen and electronic locks which will allow DoES Liverpool to expand its hours of operation beyond the standard work day. "DoES Liverpool Unveils Laser Cutter at Maker Night"
DoES Liverpool is looking forward to unveiling the new laser cutter they have recently received to enable members of the community to better understand the potential of rapid prototyping using digital fabrication. The laser cutter will be available for use by members of the community free of charge and will be unveiled at Monday’s Maker Night from 6:30pm in the Gostins Building, Hanover Street. 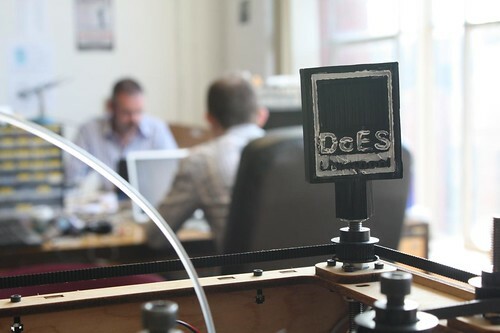 The laser cutter supplements the existing digital fabrication tools available in DoES Liverpool – a 3D printer and a CNC machine – and will vastly extend the prototyping capabilities available to the community. 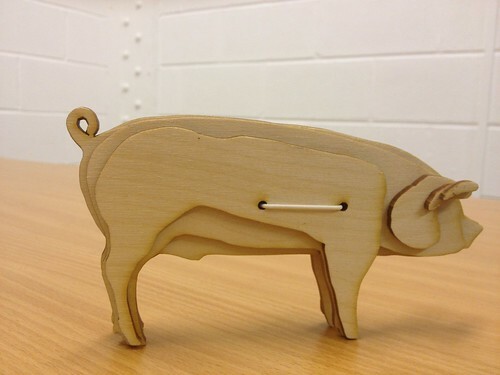 Many members of the community have already been working with laser cutting, using the device that is available during Maker Nights in the Art and Design Academy of Liverpool John Moores University but the availability of one within DoES Liverpool’s workshop means that work can continue on projects beyond that monthly visit. Preparing designs for the laser cutter is surprisingly simple. Any vector drawing package can be used such as the free and Open Source Inkscape or commercial packages such as Adobe Illustrator and Corel Draw. Once prepared designs are simply sent to the laser cutter which can very quickly engrave and cut the designs from plywood or perspex. 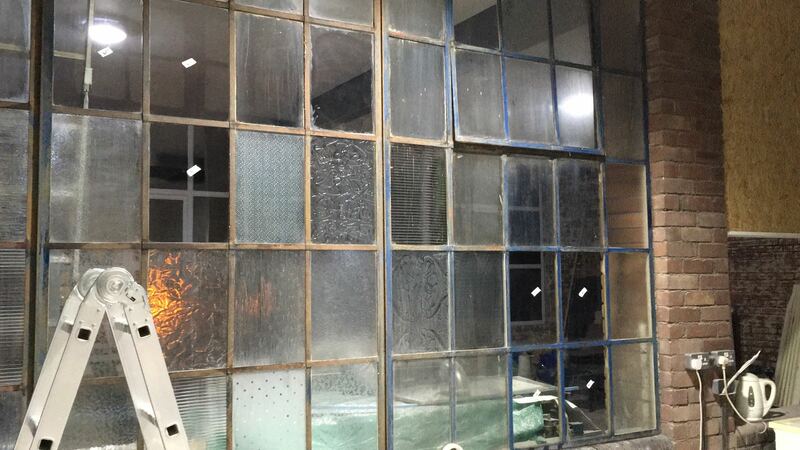 Objects can then be constructed, any problems revised and a new version cut out very quickly. Help is available from the DoES Liverpool community for those who need it and lots of designs are freely available on the internet too. In fact it’s possible to cut more exotic materials too, Maker Night regular Beth Edmondson works with leather and fabrics to create interesting clothing designs and decorations. Local artist Susan Brown has also been experimenting by using the laser to etch her own designs onto perspex blocks which she then uses to make prints. John adds, “People have developed lots of different designs that can be cut out and built, many of which are freely available on the Internet. From small sculptures of animals, through clocks, containers and camera mounts, all the way up to 3D printers. Though many of these involve other parts – nuts, bolts, motors or other electronics – their strength and structure is based on a very simple 2 dimensional design cut out on a laser cutter like ours.”. Maker Night is a free to attend event organised by DoES Liverpool with support from Open Labs at Liverpool John Moores University providing a space for people to learn, experiment and work on projects related to physical computing, digital fabrication, Arduino and electronics. They’re informal, friendly events and everyone is welcome, of any ability level. The next event takes place in DoES Liverpool’s space on the 4th floor of the Gostins Building, Hanover Street. See our flickr photostream for more laser cut goodies.